Geothermal Drilling & Heat Pump Installation. Virginia . Tennessee . Mid-Atlantic . Richard Simmons Drilling, Co., Inc. .
Conserving our natural resources. Protecting the ground water. Reducing energy costs. Accomplishing all three in an efficient and economical manner is a job well done. 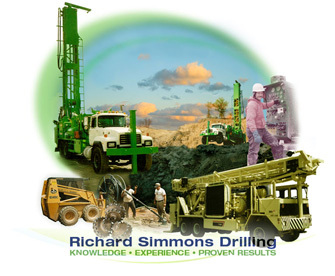 Richard Simmons Drilling Co., Inc. approaches every job with a full understanding of the necessary for the project. Whether you need two or two hundred bores, one or numerous miles of pipe, select grouts or fills, vaults or large diameter piping, Simmons consistently designs loop fields of unfailing performance. As an IGSHPA Accredited Installer and Dealer Contractor. Simmons Drilling is the leader in rock drilling for ground source heat exchangers. Our offices ensure coverage to the entire southeast. No job is too big for this 45 year old firm that has dedicated 21 of those years to the geothermal industry. With more than two dozen drills and an unsurpassed work force, we are an excellent partner for any high profile job, including schools, military bases and sensitive historic sites. We believe that our success is a results of hard work, quality services, and above all, client satisfaction. 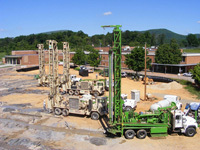 Click here to view photos of Simmons Drilling's installation of the geothermal system at Northside High School, Roanoke, Virginia.